Powers/Abilities: The Golden Angel was supposedly an accomplished professional wrestler. 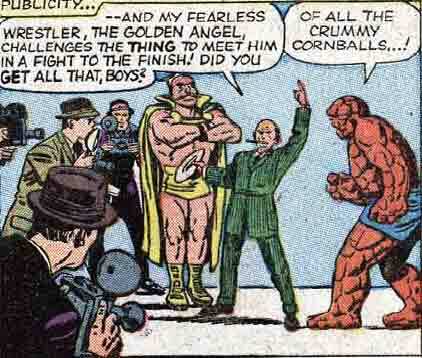 History: (Fantastic Four I#14) - When the Fantastic Four returned to Manhattan after a trip to the moon, the Golden Angel attempted to milk the event for publicity. His manager issued the Golden Angel's challenge for the Thing to meet him in a fight to the finish, and the Thing was annoyed at the request. 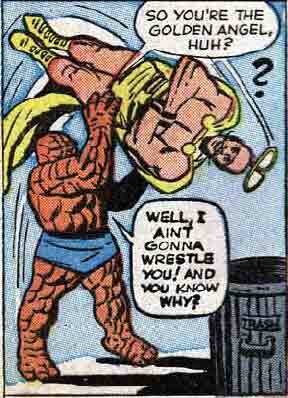 The Thing then picked up the Golden Angel and shoved him headfirst into a garbage can, claiming that he wouldn't fight him because the Angel was so big and tough that he was "shakin' in my itty bitty boots."